“Caul Grant got 28 days for contempt of court. Caul Grant and Michael Cohen were also fined £700, other protester Fiona was fined £500, Jackie Fergus was acquitted as no evidence. The four were in court yesterday for alleged charges related to breaching a police order whilst peacefully protesting on the Zebra crossings outside Royal Courts of injustice last year September 2013. Caul Grant of ‘Campaign for Truth and Justice’ began peacefully protesting after the tragic avoidable death and cover up of his 15 month baby son Prince Grant in a NHS hospital..
His quest for justice led him to become the subject of two decades of persecution and torture involving false imprisonment on previous occasions instigated by the highly corrupt law firm Bindman and Partners who had been sued by Mr. Grant ( Bindmans and Partners are also the part of the very same criminal cartel involved in my case). I don’t have any details as to what happened in court yesterday as i sadly was not there. But am told that Caul has since been taken to Wandsworth Prison..
Once again we see yet another example of the victims/ survivors (peaceful protesters against injustice) being arrested and penalised by either imprisonment or fine, while the actual real guilty parties( serious criminals) are wrongly protected by the state. Caul Grant of ‘Campaign For Truth and Justice’ has been arrested today 23 Sept. 13 together with three other people named, Fiona, Jacqui and a scientist African Professor. All were arrested today for peacefully protesting outside the notoriously corrupt ‘Royal Courts of Justice’. The four have been taken to Charing Cross Police station to be charged!! Please spread the word on all your social networks!!! Protests concluded today for the second instalment of the Weekly ‘Empowerment Mondays Protests’ , whereby outraged UK protesters who are also victims of heinous Crimes covered up by the UK courts, have joined forces and were repeatedly crossing the Zebra crossings outside the RCJ to highlight the disgust at the rampant corruption and criminality taking place by corrupt Lawyers and Judges inside British Courts. Now dubbed ‘Royal Courts Of Injustice’ due to the outrageous scale that members of the British public are being grossly abused, protesters have gathered outside the courts today and held up the traffic to raise awareness of the horrific scale of the court corruption and judicial abuse and cover ups. The inquest of Mark Duggan concludes this week, you may remember the case as he was the British Black young man whose killing triggered off the start of the London Riots in 2011. This inquest also taking place within the ‘Royal Court of Injustice’, and the general British public have absolutely no confidence that the truth will be told or that Justice will be done. UK courts and the entire Judiciary are being run likened to a mafia cartel with Judges blatantly lying on oath and concealing victims vital evidence to act in favour of wealthy criminal bosses, mobsters and those brazenly abusing public offices. Ruthless uncover abusive tactics as were used against the Lawrence family during their quest for justice after the Racist Murder of their son Stephen Lawrence are also being employed against innocent members of the British public with concrete evidence of crimes being covered up by the Judiciary. With agents and Trolls engaged in smear campaigns to discredit legitimate cases that reveal horrendous crimes and cover ups being concealed within the Judiciary. In short every possible avenue in which victims can attain justice and redress is being blocked. 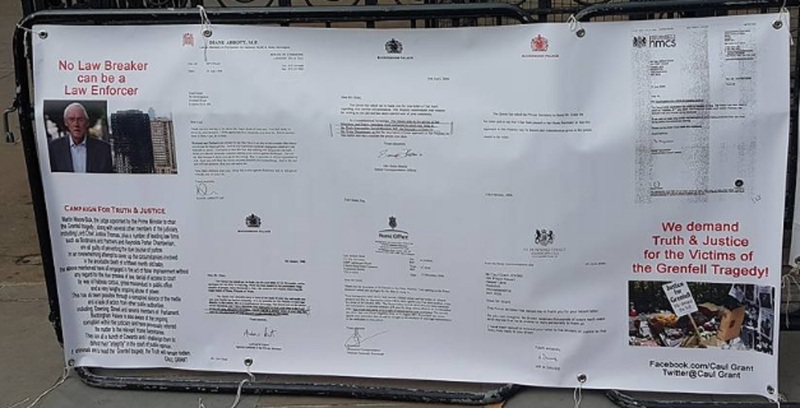 Instead of British Courts and the Judiciary addressing cases fairly in accordance with the ‘Rule of Law’ they have now built a fortress based on deceit, fraud and blatant corruption to ensure that no legitimate victim in the British public ever attains Justice within a British court. This is an absolute outrage and we the British public say.. Enough is Enough!! Caul Grant has endured two decades of being abused and tortured for trying to seek justice and have the death of his 15 month old baby son addressed inside a British Court due to a NHS negligence cover up. Sadly, Mr. Grants case is by no means unique there are regular reports of other shocking cases with victims being abused for seeking justice in the UK up and down the country. Please be warned about the corrupt Bindman and Partners law firm as there are many crimes including suspicious deaths connected to this law firm, so warn all your friends and family not to go there!! 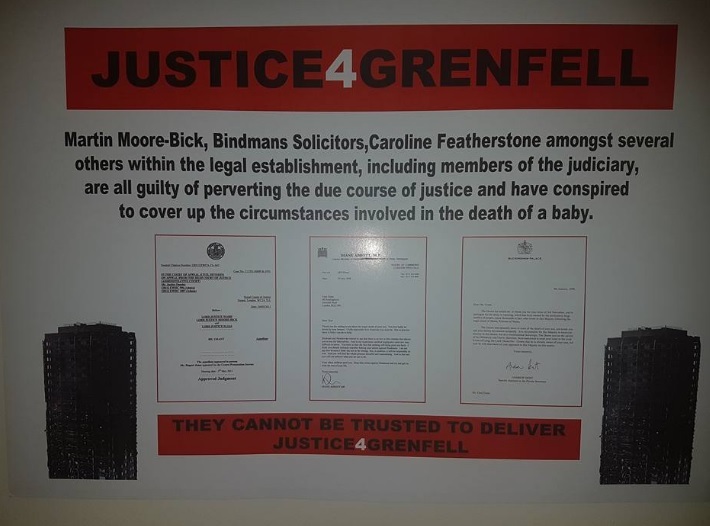 Bindman and Partners name has come up again and again in many other disturbing shocking cases whereby innocent members of the British Public with legitimate cases have been grossly targeted and abused and even in some instances murdered in highly sinister horrific ways.. Such crimes against humanity cannot be allowed to continue in the UK without being addressed, therefore we urge everyone to support the UK protests and protestors. For more information on rampant UK court and Judicial corruption perpetrated by the Law Firm Bindmans and other corrupt UK corporations. If you know about or have experienced court / judicial corruption join the efforts to address the abuse taking place by joining the weekly ‘Empowerment Monday protests’ every Monday outside the Royal Courts of Injustice!! Also Patrick Cullinane another Royal Courts of Injustice victim, shall be starting protests from 1st of October until the 4th of October 2013, please also attend these protests to demand court investigations and reforms!! INJUSTICE AGAINST ONE IS INJUSTICE AGAINST ALL!!!! STAND UP FOR OUR RIGHTS IN THE UK! NO LAW BREAKER CAN BE A LAW ENFORCER!!! PLEASE MAKE THIS INFO VIRAL TO PROTECT THE ARRESTED PEACEFUL PROTESTORS SAFETY!!!! Tweet, Blog, Vlog, Rap.. Do whatever you can to share this Breaking News!!! RULE OF LAW MUST BE RESTORED IN THE UK!!!! SO PLEASE MAKE YOUR VOICES HEARD!!!! Videos of todays Protests and Arrests to follow on shortly!!! In November 1994, Mr. Grant retained the services of Bindman + Partners Solicitors to pursue a complaint against King’s College NHS Hospital Trust for negligently giving false information about the circumstances leading up to the death of his 14 month old son. Bindman & Partners advised him in writing, that there was no law in the United Kingdom which gave protection against false advice. Mr. Grant found this very difficult to accept and sought the advice of several other law firms, who all told him Bindman’s were wrong. Mr. Grant tried to have his Legal Aid Certificate transferred to a firm who were prepared to properly represent his interest, but Bindman’s refused to release it. In August 1997 Mr. Grant then issued a writ against Bindman & Partners for several breaches of the Solicitors Code of Conduct. They included a breach of contract, willfully giving false advice and failure to act in the best interest of the client. Bindman & Partners were represented by another firm of Solicitors, Reynolds Porter Chamberlain (RPC). They offered no defence to the claim and sought only to rely on the influence of their friends or families within the Judiciary. The Senior Partner at RPC, Alan Toulson, is the brother of a High Court Judge, Mr. Justice Toulson. Alan Toulson, or his firm, went to his brother and arranged to have Mr. Grant’s claim willfully struck out of Court. RPC also arranged, with Justice Toulson, an unlawful injunction against him contacting Bindman’s directly. The actions of Justice Toulson and his brother, or brother’s law firm, is a direct contravention of Article 6, Section 1 of The European Convention. 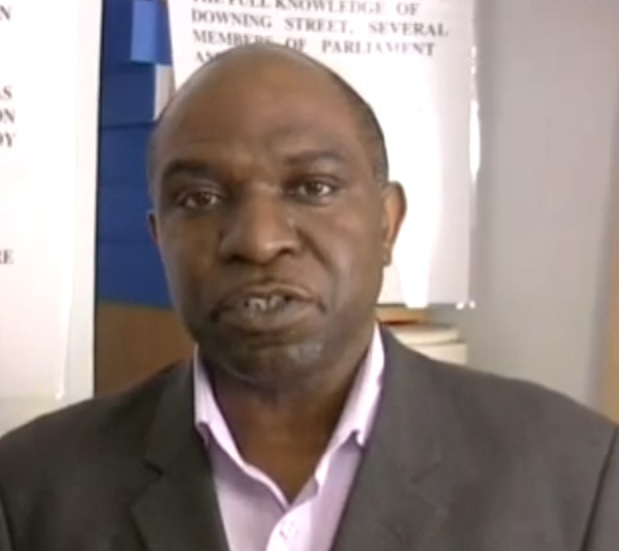 During the abuse of process and infringement of his rights, Mr. Grant made several complains to Downing Street, Members of Parliament, the media and to Her Majesty the Queen, but no help was forthcoming. In an effort to attract public attention to all what was taking place, he spray painted the windows of the offices of Bindman & Partners. Mr. Grant was subsequently arrested and prosecuted for criminal damage. He pleaded not guilty as a result of circumstances. The following Morning, 13th August 1997, he was brought before a District Judge, Mr. Baker and despite the documented fact that there were no conditions attached to his bail, the Judge remanded him to 4 days in prison. On the 17th August 1997 he was taken back to the same Court before a different Judge, Mr. Johnstone, who stated in Court, he would not become involved in what was taking place and he confirmed that there were no conditions attached to his bail and released him from custody. In June 1998 Mr. Grant was eventually convicted for the allegation of criminal damage. He appealed against the conviction and in July 1998 the conviction was overturned. The Appellate Court presided over by His Honor Judge Inman, accepted his defence of duress of circumstances. 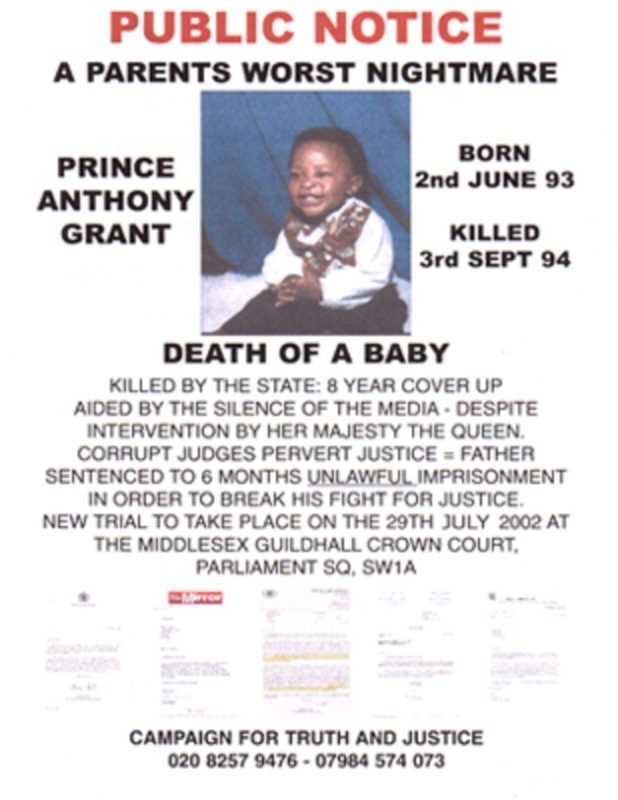 14 month old Prince Anthony Grant who died of Dehydation after being left unattended with no fluids whilst in care of Kings College Hospital NHS Trust Sometime in April 1999 Mr. Grant was presented before Mr. Justice Buckley. He ordered that if he agreed to see the Prison Medics he would consider releasing him, but he was afraid and untrusting of his order. Mr. Grant did not then, nor currently, have a mental problem. He had not committed any crime or been convicted for any crime. According to the Judge, his imprisonment was for contempt of Court and did not see or understand what his stage of mind had to do with wanting his release from unlawful imprisonment. Mr. Grant refused to see the Medics and was re-presented on 28th May 1999. He told Mr. Justice Buckley why he had refused and he turned and told Mr. Grant, “Mr. Grant the background of your case is extremely tragic. There are many ways in which you can pursue it, go home to your family” Subsequently Mr. Grant tried to get on with his life. However in February 2000 and May 2001 he was employed in the London Borough of Westminster as a Traffic Warden Supervisor. His responsibilities included the issuing of Penalty Charge Notices (PCN’s) and the supervision of others issuing PCN’s. 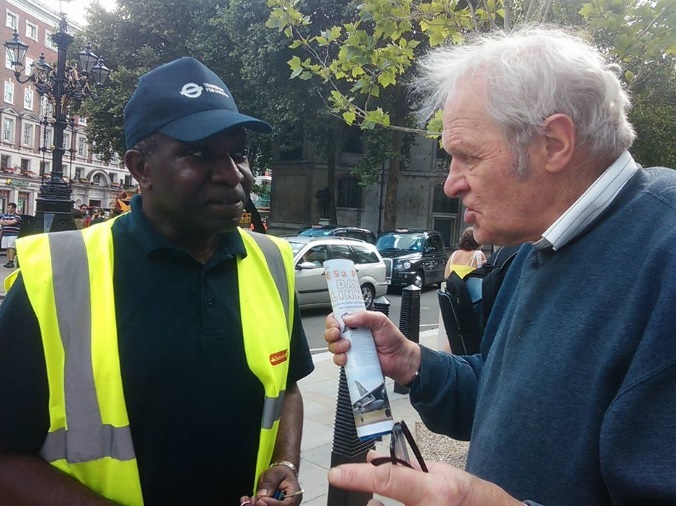 His employers wanted him to engage and encourage others to engage in activity aimed at targeting motorists in order to increase the number of PCN’s and therefore increase revenue. Mr. Grant refused to deliberately target unsuspecting drivers and refused to encourage his team members to do the same. This led to his suspension, and despite the employers’ Lawyers advising them to allow him back to work; dismissed him from employment. As a direct result of the United Kingdom’s failure to afford him the protection of Law, he was unable to take the employers to Court for unfair dismissal. At the time, he have three children within his current relationship and three from a previous marriage, which was destroyed by the State. Mr. Grant’s persecution by the United Kingdom impacted upon his ability to lawfully earn a living which would afford him the dignity to do the best he can towards the welfare of his children. It was at this point Mr. Grant decided that the UK Authorities cannot deny him all protection of Law and still seek to punish him by the same Law. Rebellion was a last recourse against the flagrant abuse, total disregard and contempt of the Rule of Law by the UK and its Judicial Authorities. In fact the United Kingdom has ignored citations from its own Attorney General, Lord Goldsmith, who quoted Justice Brandeis of the United States of America who said, over 50 years ago: “In a Government of Laws, existence of the Government will be imperiled if it fails to observe the Law scrupulously. Government is the potent omnipresent teacher. For good or ill, it teaches the whole people by its example. If the Government becomes a Lawbreaker, it breeds contempt for the Law and invites every man to become a Law unto himself, it invites anarchy”.